Tire tread separations are an unfortunate byproduct of modern steel-belted radial tire technology. Due to the difficulty in adhering steel to rubber, there is a potential for tread separation in all steel-belted radial tires if they are not designed and manufactured properly. This is true especially at high speeds and in hot weather. When global tire manufacturers cut corners in the design and manufacturing process and place profit over safety, the threat of catastrophic tread separation increases. While these high-profile examples have resulted in serious injury and property damage, virtually all tire manufacturers in the United States have suffered steel-belted radial tire tread belt separations since the 1970s. Tread belt separations frequently result in tire blowouts, and the results can be catastrophic. Even when a tire does not completely lose pressure, drivers often lose control of vehicles when a tread and belt separate from the body of the tire. Design failure like this contributes to rollover crashes blamed for countless serious injuries and fatalities. Tire blowouts and sudden tread failures result in air escaping – either slowly or all at once – leaving a car or truck with less air pressure to support the vehicle’s weight. When a blowout occurs while driving, it can create a dangerous driving situation that requires critical response. The failed tire results in a reduced capacity for driver to successfully control their vehicle. When a tread delaminates and separates at high speed, drivers sometimes report hearing a loud thumping noise before the vehicle loses control. This loss of control has been linked to a combination of factors, including the loose tread pieces striking against or catching on the undercarriage of the vehicle. When a rear tire tread fails, the result is a braking action in the direction of the tire failure. When the driver attempts to correct for this braking action, the vehicle usually goes out of control in the opposite direction as its ability to corner is significantly reduced. Accident investigators and representatives for tire manufacturers often mistakenly refer to this as “overcorrection,” but it is the normal and appropriate reaction to the pulling phenomenon experienced by the driver during a tire failure. This sequence of events following a high speed belt separation or tire blowout occurs so rapidly that it is virtually impossible to handle most highway tread separation failures and resulting loss of control of the vehicle. This has been documented in tire tread defect litigation and in multiple tests, including tests conducted on Ford Explorers equipped with Firestone tires in which an experienced test driver, who knew a tire tread was going to separate, still failed to maintain control and could not prevent a vehicle rollover. This rollover threat caused by flawed tire designs and manufacturing processes is exacerbated by high-center-of-gravity vehicle designs, such as many sport utility vehicles. 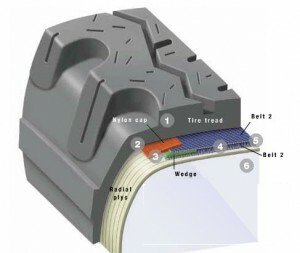 The tire industry is aware of techniques to correct engineering flaws and faulty tire design by installing wedges and cushions at the belt edges, an under tread protecting steel belt edges, and nylon overlay design modifications known as “safety belts.” These tire design improvements are widely used in tires manufactured for the European market as well as many American tires. Nylon overlays virtually eliminate tread separation problems unless a tire has a significant design or manufacturing defect. Even then, these nylon overlays will substantially delay failure. Many of these tire manufacturing complications are illustrated in this Wilderness AT tire from Firestone. Tire manufacturing plants are worsening the problems by running on 12-hour shifts with tire builders working on a quota incentive system, which unduly stresses workers to churn out tires and disregard manufacturing defects. all sorts of other contamination that have been cured into tires. We have also learned from plant workers that outside tire inspectors have been misled by various means during inspections, including hiding defective tires and showing inspectors the same tire repeatedly once it had passed inspection. To the trained eye, defective tires with separated or delaminated belts tell a story. When examining a separated tire one should look closely at the separation to determine whether there is any rusty wire, bare wire or brassy wire exposed. Corroded wire is often evidence of moisture contamination during manufacturing. Bare wire is an indication of a manufacturing adhesion defect. Brassy wire is a strong indication of insufficient adhesion, including the use of older or expired adhesives in the manufacturing process. High resolution photographs should be taken of any exposed surfaces as quickly after an accident as possible to document any exposed wire conditions and the condition of the tread surface where a tire has delaminated. Faced with scrutiny about serious injuries caused by dangerous and defective tires, the tire industry has attempted to shift the burden for defective tires to the victim in an accident. In tire defect litigation, corporate representatives and their teams of defense lawyers have attempted to claim that belt separations are the result of impact damage or under inflation. In fact, under inflation does not cause tread belt separation in a properly constructed, properly designed tire. Unfortunately, it is virtually impossible for consumers to know whether a steel-belted radial tire is under inflated by visual inspection alone. It is often difficult, if not impossible, for forensic tire experts to determine upon visual examination whether a tire has incipient tread belt separation prior to an actual incidence of tread separation failure. The potential for under inflation is increased by the air permeability of steel-belted radial tires. All steel-belted radial tires leak air to some degree. Design and manufacturing defects can accelerate this leakage rate. Because of the air permeability of steel-belted radial tires, almost all tires are driven with less than recommended air pressure at some point during the course of their lifetime and, as noted, this is usually not observable by the consumer. Accordingly, drivers are often unaware that a tire is under inflated or has been under inflated previously. Tire manufacturers often claim that damaging information contained in corporate records is protected from disclosure as trade secrets. In reality, comprehensive analysis of steel-belted radial tires is regularly reported to tire manufacturers by Smithers Scientific Services so that all manufacturers are routinely provided with the physical properties and chemical makeup of their competitors’ products. These are clearly not trade secrets. Tire manufacturers also reverse engineer their competitors’ products on an ongoing basis and are well aware of the composition of tires manufactured by competitors. Tire manufacturers purchase raw materials and tire manufacturing equipment from the same vendors. As a result, there is very little bona fide trade secret information that is not known by all tire manufacturers about competitors’ tires. All manufacturers build tires essentially the same way with essentially the same equipment. Some tire manufacturers even build tires for competitors under the competitor’s brand name. Unfortunately, unless a motorist or passenger is seriously injured or killed, individual consumers have very little recourse against tire manufacturers for making and selling defective and dangerous products. Consumers should, however, contact the National Highway Traffic Safety Administration (NHTSA) when they believe defective tires have caused an accident. They should also contact an attorney with experience in tread defect litigation to ensure that a proper investigation is performed immediately. Increasingly, we are hearing from consumers who are taking matters into their own hands by filing small claims against tire manufacturers in local courts. They are forced to pursue these cases on their own because it is virtually impossible to find a lawyer who can pursue a tire claim that does not involve significant property damage, serious injury or death. If you cannot find a lawyer, we strongly urge you to send your information to NHTSA and to your congressman and senator. The tire industry has been able to avoid responsibility to the public for decades by hiding the magnitude of accidents, injuries and deaths and by hiding internal records that establish the extent of the tread belt separation hazard throughout the industry. Unfortunately, many courts have unwittingly assisted in this cover-up by granting protective orders that are abused by tire companies. Unless concerned citizens react, the tire industry will continue to ignore dangers created by their defective products. If you or a loved one was injured or killed by tire tread separation, or if you are an attorney investigating a tire accident lawsuit, contact Kaster Lynch Farrar & Ball, at 800-311-1747 or info@thetirelawyers.com.